Signs of opposition to policies of Saudi King Salman and his son, Crown Prince Mohammed bin Salman, and potentially increased domestic polarization have in the past week spilled on to the streets of London while a just released report questioned the economic and political benefits of Britain’s relationship with the kingdom. The London incidents, involving a brother of King Salman as well as an assault on a Saudi critic, suggest a long suspected greater degree of domestic questioning of Saudi Arabia’s 3.5-year-old ill-fated war in Yemen than has been publicly evident until now. The Salmans have sought to crush dissent with mass arrests of activists, religious scholars, businessmen and members of the ruling Al Saud family; a power and asset grab last November under the mum of an anti-corruption campaign that targeted some of Saudi elite’s most prominent figures; and legal measures criminalizing criticism. Although focused on British-Saudi economic and political relations, the report by King’s College London and the Oxford Research Group calls into question not only British but also by implication long-standing Western willingness to turn a blind eye to the kingdom’s violations of human rights and its conduct of the Yemen war that has produced one of the worst humanitarian crises in post-World War Two history. The London incidents coupled with increasing European questioning of arms sales to Saudi Arabia, including this week’s cancellation by Spain of the sale of 400 laser-guided precision bombs, suggests that Saudi Arabia is finding it more difficult to keep domestic dissent and international criticism under wraps. Spain follows in the footsteps of Germany, Norway, the Netherlands and Belgium who have suspended some military sales. The Spanish cancellation came on the heels of last month’s Saudi-Canadian spat sparked by a call on Saudi Arabia by Canada’s ambassador to the kingdom, Dennis Horak, to release detained women activists, including Samar Badawi, the sister-in-law of a recently naturalized Canadian citizen, Ensaf Haidar. Ms. Haidar is married to Ms. Badawi’s brother, Raif Badawi, who was arrested in 2012 and sentenced to ten years in prison and 1,000 lashes for promoting freedom of expression and women’s rights. It also came in the wake of the withdrawal of Malaysian troops from the 41-nation, Saudi-sponsored Islamic Military Counter Terrorism Coalition (IMCTC) and the closure in Malaysia of the Saudi-backed King Salman Centre for International Peace (KSCIP). Asked by protesters who he held responsible, Prince Ahmed, who served as deputy interior minister for 37 years and briefly as interior minister under King Salman’s predecessor, King Abdullah, said “the king and his heir apparent,” a reference to King Salman and Prince Mohammed. 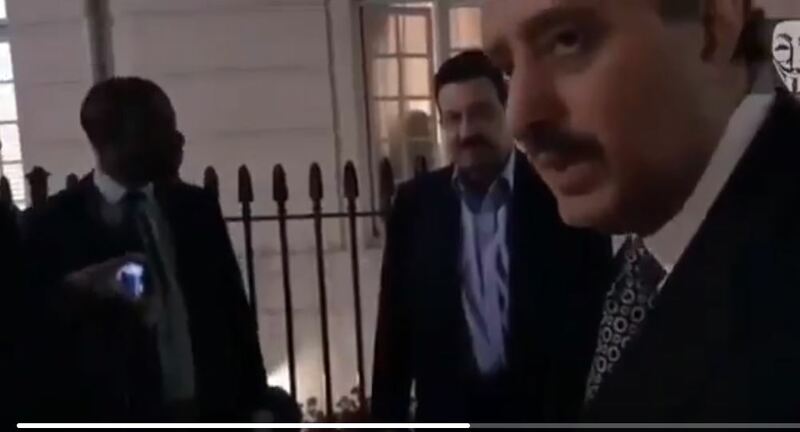 Meanwhile, video on social media showed Ghanem al-Dosari, who hosts a satirical show on YouTube critical of Saudi Arabia, being accosted by supporters of King Salman and Prince Mohammed. In a bid to stymie criticism, Saudi prosecutors this week reportedly sought the death penalty against prominent cleric Salman Al-Odah who was detained a year ago. “The Saudi attorney general accused my father @salman_alodah of 37 charges and asked for his execution,” his son Abdullah said in a tweet. He said some of the charges were related to comments Mr. Al-Odah had posted on Twitter and membership in organizations associated with Qatar and Qatari-Egyptian Islamic scholar Sheikh Yousef al-Qaradawi, who is close to the Muslim Brotherhood. Mr. Al-Odah has 14 million Twitter followers. Prosecutors last month demanded the death sentence for five human rights activists, including Israa al-Ghomgham, a Shiite activist arrested with her husband in 2015. Ms. Al-Ghomgham is thought to be the first female Saudi campaigner to face execution. Applying a cost-benefit analysis, The Kings College/Oxford Research Group report concluded that, contrary to the projections of the government of Prime Minister Theresa May and popular perception, Britain enjoyed limited economic benefit from its relationship with Saudi Arabia while suffering considerable reputational damage. The report noted that Britain’s US$ 8 billion in exports to Saudi Arabia accounted for a mere one percent of total exports in 2016. The British Treasury reaped US$ 38.5 million in revenues from arms sales or a paltry 0.004 percent of the Treasury’s total income in 2016. Overall, Britain’s defense industry produced in 2010/11 only one percent of the country’s total output and created a meagre 0.6 percent of all jobs. The King’s College/Oxford Research report took issue with assertions by successive British governments that trade and weapons sales as well as support for Saudi Crown Prince Mohammed bin Salman’s reform programme enabled Britain to influence Saudi policy and introduce democratic and human rights values. “There is little evidence, based on publicly available information, that the UK exerts either influence or leverage over Saudi Arabia. In fact, there is greater evidence that Saudi Arabia exerts influence over the UK. There is a contradiction between the UK presenting itself as a progressive, liberal country and defender of the international rules-based order, while at the same time providing diplomatic cover for a regime, which, based on our analysis, is undermining that rules-based order,” the report said. The report’s call on the British government to critically analyse its foreign policy and limit and be more selective and transparent in in its engagement with Saudi Arabia could constitute an approach that would appeal to other European governments. It could also attract support from some members of the US Congress, despite US President Donald J. Trump’s backing of Saudi policies, with public criticism of the kingdom mounting in Europe and the United States as well as growing unease among some officials and politicians.